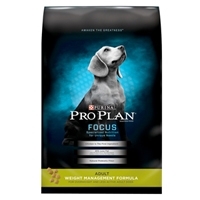 Pro Plan Dog Chicken and Rice 37.5 lb. 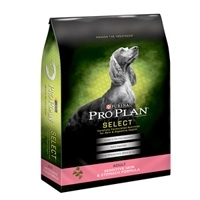 Purina Pro Plan Selects Natural Adult Dog Food is an ideal medley that offers a natural source of energy to dogs, along with tantalizing their taste buds. 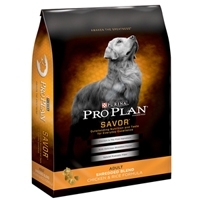 Pro Plan Dog Sensitive Skin & Stomach 33 lb. 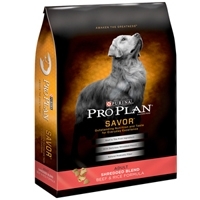 Pro Plan Dog Sensitive Skin & Stomach 5/6 lb. 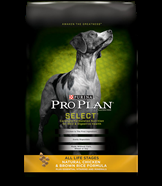 Pro Plan Adult Dog Small Breed 5/6 lb. Concentrated nutrition in small bite-size kibbles with high levels of protein to meet a small breed dog's unique nutritional needs. Calcium, phosphorus and other minerals support strong bones and teeth. 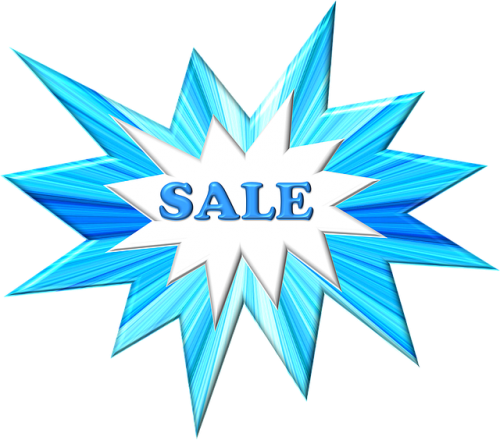 Complete nutrition with vital antioxidants helps support a healthy immune system. 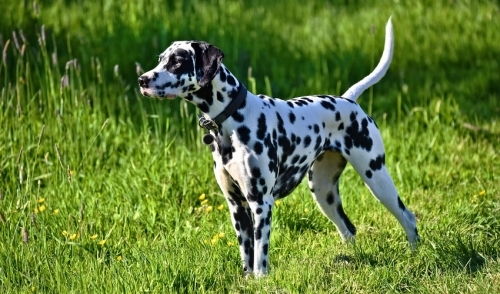 Vitamin A and linoleic acid (an omega-6 fatty acid) for healthy skin and a lustrous coat. 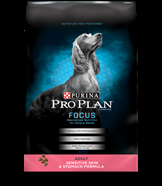 Highly digestible with natural prebiotic fiber (sourced from wheat bran) to help promote digestive health. 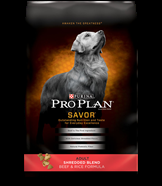 Pro Plan Shredded Blend Dog Food Lamb & Rice 5/6 lb. 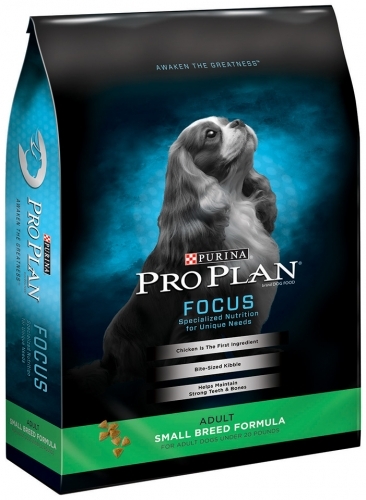 Small Breed formula for puppies is specially formulated to bolster your dog's key protective systems - the immune system, digestive system and skin & coat systems - with vital antioxidants to help support a healthy immune system and Vitamin A and Omega-6 fatty acids to promote healthy skin and a lustrous coat. 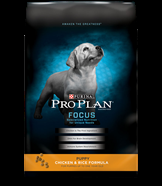 Original Chicken & Rice Formula for puppies is specially formulated to bolster your puppy's key protective systems - the immune system, digestive system and skin & coat systems - with vital antioxidants to help support a healthy immune system and Vitamin A and Omega-6 fatty acids to promote healthy skin and a lustrous coat. 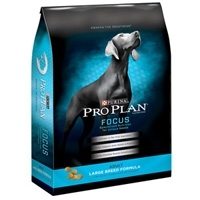 Also helps reduce accumulation of plaque and tartar for dental health. Pro Plan Chicken and Rice canned food is a complete and balanced nutrition that helps support a strong immune system in your adult dog. 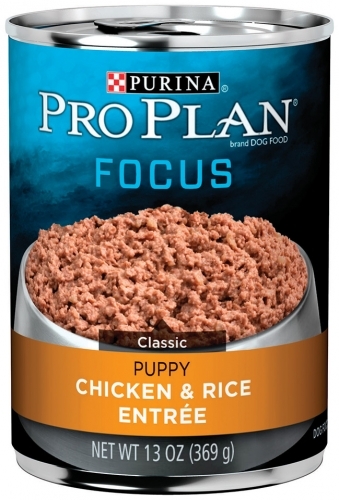 Contains real Chicken which is the number 1 ingredient. Packaged in easy-open flip-top cans. 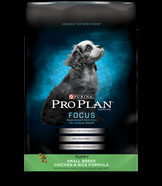 Pro Plan Canned Chicken and Rice for Puppies is a complete and balanced nutrition that helps promote lean body mass for an ideal body condition in you puppy. Packaged in a easy-open flip-top can. 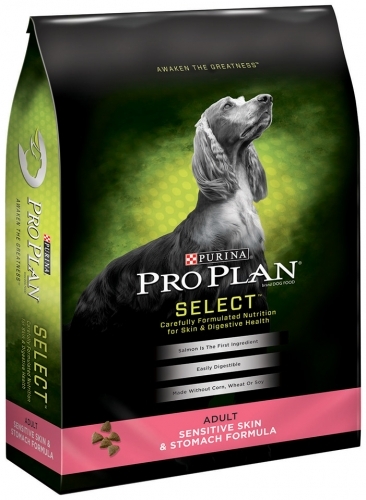 Pro Plan Extra Care Sensitive Skin & Stomach is a complete and balanced nutrition formulated for easy digestion and to help reduce the risk of food sensitivities. Made with real salmon which is the #1 ingredient and packaged in an easy-open flip-top cans. Pro Plan Weight Management Turkey and Rice is a complete and balanced nutrition with optimal protein level that helps your dog lose fat, not muscle. Made with real Turkey and is packaged in an easy-open flip-top can.